Geek girl Elle Wittimer lives and breathes Starfield, the classic science fiction series she grew up watching with her late father. So when she sees a cosplay contest for a new Starfield movie, she has to enter. The prize? An invitation to the Excelsi Con Cosplay Ball, and a meet and greet with the actor slated to play Federation Prince Carmindor in the reboot. With savings from her gig at the Magic Pumpkin food truck and her dad’s old costume, Elle’s determined to win… Unless her stepsisters get there first. Teen actor Darien Freeman used to live for cons, before he was famous. Now they’re nothing but autographs and awkward meet and greets. Playing Carmindor is all he’s ever wanted, but the Starfield fandom has written him off as just another dumb heartthrob. As Excelsi Con draws near, Darien feels more and more like a fake, until he meets a girl who shows him otherwise. Danielle Wittimer fondly remembers her father as the man who encouraged her to aim for the stars. To ignite. Since her father's passing and her late mother a distant memory, Danielle lives with Catherine. A woman who has squandered away her inheritance on frivolous material possessions, ensuring her entitled offspring are indulged and placated. Darien Freeman is a Starfield enthusiast and on the threshold of critical recognition as the immortalised Federation Prince Carmindor, an intergalactic television series rehabilitated for the silver screen. Darien's professional career is governed by his overbearing managerial father so when he is forced to attend a convention to promote Starfield, he decidedly contacts the organisers to cancel his appearance, discovering fellow Starfield enthusiast Danielle. Danielle is a spirited character and only restricted by her circumstances, the mean spirited woman her father married preceding the passing of her mother and her daughters, equally as malevolent. Her only solace is Starfield, a science fiction series shared with her father and allowing her to honour his memory. Danielle is denied compassion and appreciation, forced into a life of servitude after her father passed. Danielle is gentle, demure, with a kindness neither her new mother or siblings deserve. Catherine, Chloe and Calliope are villainous and authentic to the original fairytale. Thankfully part associate part accomplice Sage is a wonderful support for Danielle. Elle finds comfort in Starfield until vapid actor Darien Freeman is assigned the heroic portrayal of Prince Carmindor and Elle writes a scathing article scrutinising Darien and becomes an internet sensation. Although Darien is a lonely young man, gentle and in need of positive guidance, his circumstances were extensively due to his aggressive and opportunistic father. In the original television series, Prince Carmindor is a character of colour and a significant inspiration to Darien. The loneliness and betrayal Darien carries is palpable and I was appreciative of the quiet intensity of both Elle and Darien's narratives. The romance was magnificent. I'm delighted by narratives that reinvigorate conventional romantic tropes, using media such as text messaging as a form of communication. Adolescents and adults spend their lives online and it was captivating experiencing Elle and Darien falling in love. The tentative friendship and intellectual attraction was delicious. I loved being introduced to the Fandom world through both Danielle's and Darien's narration. The passion and enthusiasm was infectious and vividly portrayed. 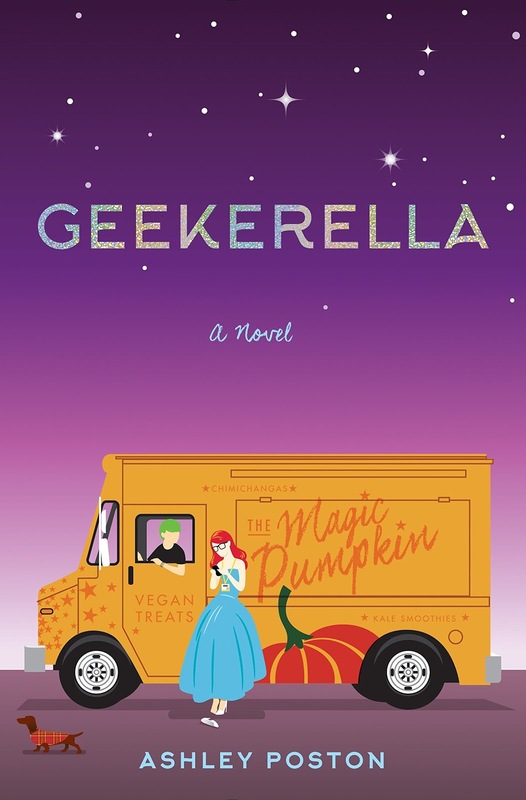 Geekerella is a diverse and modernistic fairytail, charming, delightful and unequivocally captivating. Thanks for your lovely review! I'm so glad to see you enjoyed this one. I wasn't really sure for awhile, but I keep hearing good things - and it does sound like something I'd really enjoy. I hope to read it soon! It's so lovely Lauren, such a delight to read and wonderful diverse representation. I spotted this on goodreads and thought It sounded fantastic! Your review proves it. Another one for the TBR list. I think this will be a good book for when I'm in need of a pick me up! Awesomesauce. It's one of those reads that lifts your spirits Sarah, it's absolutely captivating and I read into the long hours of the morning. I can guarantee you'll adore Geekerella too. I loved it too! The re-telling was done so well. Keeping what works while not adhering so much to the original as to bog down the story. And the book itself is gorgeous! Wasn't it just Karen. It was so entertaining and even though it's a retelling, it was so lovely and refreshing. I loved it immensely. YAYAYAY! I am so excited at how good this is! And cute, can't forget the utter cuteness!! Awesome review, hon! Thanks Verushka. One of my favourite contemporaries this year. This sounds utterly adorable, Kelly! I rarely go for Cinderella retellings (for nothing will beat A Cinderella Story in my mind), but given the geeky spin, this seems like it would be a fun read. Thanks for sharing the review! I was a little hesitant too because usually the storyline is unrecognisable but it was so lovely. I loved seeing their interactions as strangers and Elle's friend Sage was absolutely brilliant and almost stole the show! I can't wait to see what you think of it Joy! Thanks Anisha and yes! This is a must read, so lovely and wonderfully diverse. Can't wait to see what you think of it! Wohoo, Kelly! I'm so pleased you liked this one too. It was a really great story and I'm excited that more people are discovering and liking it too. I'm a sucker for non-traditional romances. The texting/letters trope is my favorite. I feel like that way the romance feels a lot more genuine because they are actually getting to know each other. I'm excited to pick up more by Poston! Me too! We live in a technological age and it always baffles me why most authors aren't incorporating technology throughout their narrations. The internet and phones are such a way of life for most teens who have access, but authors just seem incredibly out of touch in that regard. It's wonderful Hana, I do hope you're able to ask for a copy at your local library. This sounds like an interesting take on Cinderella. Geeky Cinderella? I am amazed how authors come up with ideas to write. It's brilliant. So lovely and wonderfully written. Great review! I really want to get my hands on this one soon. On another note, LOVE the formatting of your blog and reviews! Thanks Destiny, that's really lovely of you. It's a wonderful read, I'd love to see what you think of it. OH MY GOD I NEED THIS BOOK SO MUCH. I'll wait here while you buy a copy. You need this book in your life. I'm so excited for this book! Cinderella retelling and geekiness?? Yes please! I've already spotted this book in my local bookstore but I'm waiting for the end of the month to buy it, lol. Book nerd problems XD. I hear you there Soudha. It's amazing and well worth buying your own copy to read again and again. it'll be one of my go to books when I need a lift. it's absolutely delightful. I'm so looking forward to this I'm glad you loved it! After reading Queens of Geek I just want all the geeky fandom books, and this cover is stunning. You may need to extend it to project ten, project fifteen or project five thousand and sixty eight soon. There's just too many awesome new releases coming out and Geekerella is absolutely brilliant!